The Horror Section: Digging In. 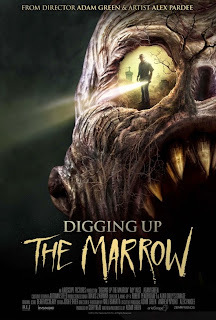 Last week I checked out a screening of Adam Green's newest flick Digging Up The Marrow. 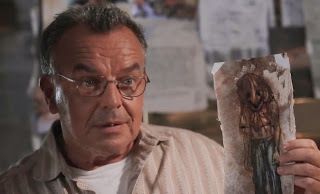 A filmmaker (Adam Green as himself) and his crew become involved with an eccentric ex-detective named William Dekker (Ray Wise) who claims he's discovered a race of beings that live underground in something called The Marrow. Despite some minor quibbles, I found Digging Up The Marrow to be quite an entertaining yarn. I knew almost nothing about it going in (a rarity these days) other than that it was a faux documentary starring Green and Wise, so the air of mystery added to the allure. 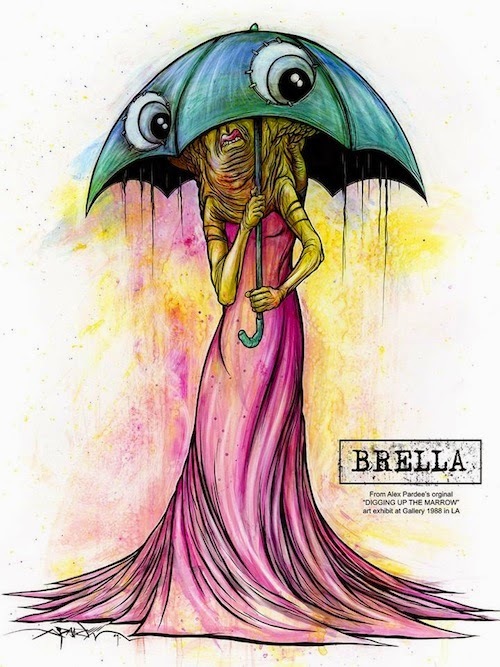 The movie builds a well-realized mythology through the images and stories provided by artist Alex Pardee. I found out after that the project was five years in the making, when Pardee first met Green at a convention and talked about this world he had created. Green was so enraptured, they began fleshing out an idea to bring the Marrow to the big screen. One of Alex Pardee's original art pieces. Now that The Marrow has been realized, I was relieved to see that it wasn't all smoke and mirrors and there were not only some actual monsters in this, but they were also, much appreciatively, done practically. Perhaps taking a cue from the 1990 film Nightbreed - an obvious influence - they tried to make the inhabitants of the Marrow look as real as possible and for the most part, they succeeded. I felt they may have gone for something a bit beyond their means with the featured monster of the climax, but still, good on them for trying. But the real heart of this picture is Ray Wise, as William Dekker. He is excellent in this. You believe what he's saying, even as he becomes increasingly erratic as the movie goes on. His presence strengthens the proceedings, as the parts with Green and his cohorts can be a little clumsy at times. A lot of the piece feels improvised, but apparently everything was rigidly scripted, so I can only praise Green for that. It takes skill to fabricate the awkwardness of natural behaviour. There are those out there who have become irritated with Green's persona (of which he plays an exaggerated version in the film), but I've always thought him to be a passionate filmmaker. His appearance in Toronto while promoting Hatchet in 2007 was rather endearing and I've kept my eye on him since. Sure, he has his vanity project in Holliston, and the Hatchet franchise as a safety net, but he also does really interesting one-offs like Frozen and this. These are the self-contained stories I'm really interested in and I can only hope he keeps on making them in the future.